Hello, Doknow.org fans. Today I will show you some creative way to make a chocolate bowl, chop some fruits in it and bring joy and delight to the whole family. A balloon, a ceramic or glass bowl (the balloon must partially in it) and two colors of chocolate – brown and white. Blow the balloon and put it in the bowl. You may have to stick it a little bit in order to attach it firmly. 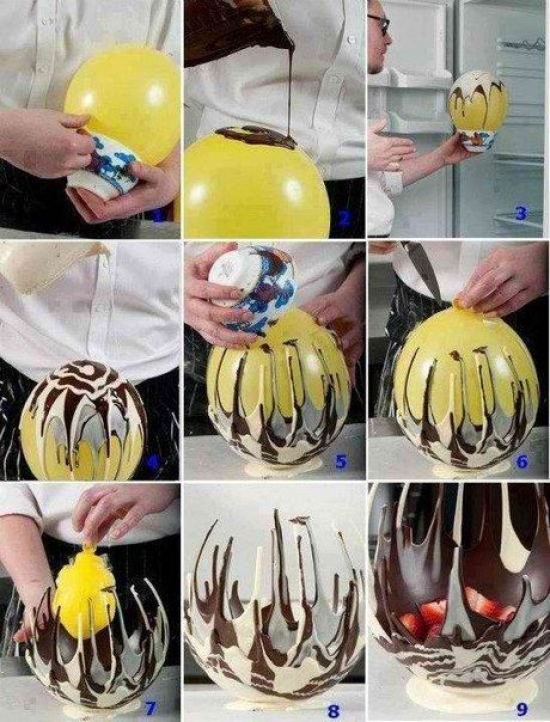 Melt the brown chocolate and poor some over the top end of the balloon – see picture 2. Melt some white chocolate and poor it over the brown one – pic.3. Repeat the procedure several times, but each time poor less chocolate in smaller circles pic.4. Poor some chocolate (white in our case) at the tabletop and while still hot, flip the balloon (with the chocolate end down) and stick it to the chocolate on the table. This will create the bottom for your chocolate bowl. Take what has left of the chocolate and poor it from the side to the bottom, forming chocolate fingers. Take a sharp knife or a needle and punch the balloon. Remove it after that from the bowl – gently, not to break the chocolate fingers. The bowl is ready! Chop some strawberries or other fruits in it the serve the desert. Enjoy!